The Ritz-Carlton, Kuala Lumpur offers the perfect weekend getaway in the vibrant heart of the city. 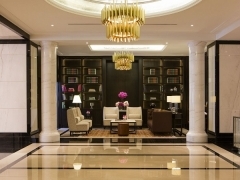 Begin planning your stay in one of our luxurious accommodations by visiting The Ritz-Carlton Kuala Lumpur now! Rate is per room per night and subject to 10% service charge and prevailing government tax, based on single or double occupancy, exclusive of taxes, gratuities, fees and other charges. This offer does not apply to groups, negotiated or discounted rates. This offer cannot be combined with any other offer or promotion and is not applicable for Rewards Redemption stays. Advanced reservations are required. Offer is subject to availability. All cancellations and changes must be received 72 hours prior to guest’s arrival, or a cancellation fee equal to a minimum of one night’s room rate will be charged for the reservation.